In most cases, the first step toward getting your neighbor to quiet his dog is to speak with the neighbor. Be friendly when doing so -- a smile and an understanding attitude go a long way toward resolving a problem. For all you know, the barking may be disturbing him as well. If your neighbor is unwilling or unable to correct the problem, you may need to take legal action. Otherwise, you can try incorporating sound barriers and discouraging wildlife to provide some peace. Learn your local ordinances. If you cannot reach an amicable solution with your neighbor, you can consider legal remedies. Noise ordinances and nuisance animal laws vary from one location to the next, so you must research those applicable in your own town. Contact the local police or sheriff’s department, your local homeowners’ association or animal control office for advice. If you live in an apartment, seek your landlord's help. Avoid taking matters into your own hands. Spraying water, yelling, throwing items and other such behaviors are entirely inappropriate. They may injure or frighten the animal, potentially placing you on the wrong side of the law. It is wise to document the problem by recording the barking sounds with a tape recorder, video camera or smart phone. A variety of anti-bark devices are available commercially. They vary widely from one model to the next, but most work by producing unpleasant stimuli when they detect barking. Some models blast a loud tone, audible to both humans and dogs; others produce a tone that only dogs can hear. The use of such devices is likely to increase any friction between you and your neighbor, is potentially distressing to dogs and may be met with scorn by local law enforcement. Regardless of these significant drawbacks, the best reason to avoid using such products is that few produce reliable, consistent results. The nightly activities of raccoons, opossums and rodents can trigger dogs to bark. Ensure that you are not attracting wild creatures by leaving garbage cans unsecured or by feeding your own pet outdoors, and politely request that your neighbor do the same. If this does not cause the local critters to find somewhere else to scavenge, consider adding motion-detecting light systems, which can discourage the presence of nocturnal wildlife. If your neighbor is ultimately unwilling or unable to address the problem, you may be able to achieve some serenity by installing sound barriers. For example, placing a row of cedar trees or a vine-covered lattice along the border of your yard may help reduce the volume of the barking. Physical structures -- such as privacy fences or out buildings -- may also help. Consider using white noise generators in your bedroom or upgrading your home’s windows and insulation to block the disruptive sounds. WTOP: What's the Best Way to Stop Your Neighbor's Barking Dog? 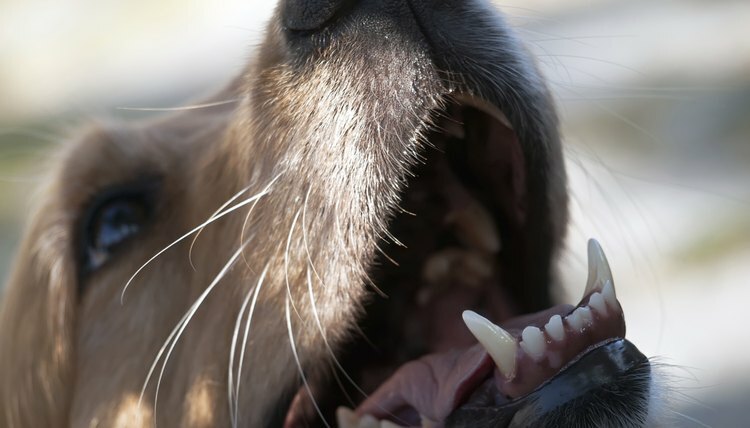 The Oklahoman: How Can I Make My Neighbors' Dogs Stop Barking?